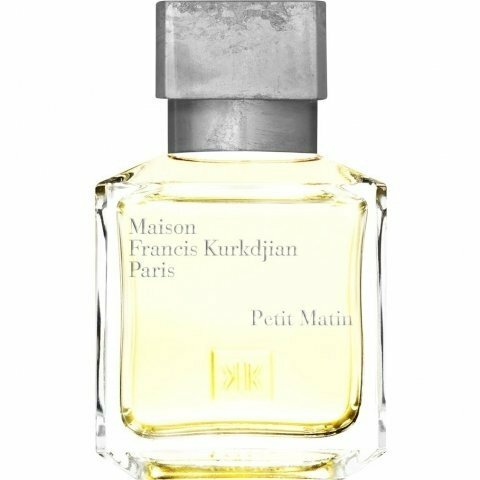 Petit Matin is a popular perfume by Maison Francis Kurkdjian for women and men and was released in 2016. The scent is citrusy-fresh. It is still in production. By my test by the brand MFK I took of course also a small filling of this. I've tested it several times by now. A fragrance I like very much like many others of this brand. MFK's simply have style and elegance and are not as expensive as many other niche labels. In many shops you pay about 120 Euro for 70ml. Like most MFK's: This is also extremely suitable for everyday use, but can also be worn in leisure time and in the evening. Similar to Aqua Universalis, Aqua Universalis forte and Aqua Celestia but rather a fresh clean everyday scent, which is more wearable in spring and summer. Especially in everyday life, work and serious activities. The fragrance pyramid is clearly arranged and can also be easily smeared out here. Since the fragrance has hardly any development, it is right here not to divide into head-heart basis. Many MFK's have little fragrance development, so you shouldn't be a big fan of big developments. Personally, I don't mind getting a pleasant fragrance. Throughout the course a clean scent with a lot of lemon. In my opinion there is also a fabric softener Vibe, which comes across as very noble and well-groomed. Reminds me of freshly washed laundry with a really good and pleasant fabric softener. Ordinary but pleasant notes such as lavender, musk and ambroxan get through well here and provide a cultivated fragrance. Also a flowery freshness by the orange blossom is very present here. Altogether a very cultivated clean scent, which is also slightly creamy. Overall very balanced and easy to carry. The DNA is rather predestined for a serious appearance, less casual. Performance is decent. 6-7 hours approx. with decent but not too extreme Sillage. Predestined for the summer working day. What strongly inclined me to this one fræ the outset was that strong °sweaty° musk note. °Sweaty°? : well, we could hold forth at length as to how some of the most attractive notes in perfumery have these °minging° parallels, but that is a large part of what maketh perfumery so fascinating & even a bit °sinful° perhaps. Anyway, the figure that comes to my mind whereby to relate the kind of muskiness that this one shows-forth copiously is, well, °sweatiness°! I have honestly tried to devise another figure that fits as well or better, but I cannot! And it's not that I am attracted to the smell of actual sweat ... ... or am I?, subliminally, or maybe °pheromonically°, or something like that. And it's not that it's actually ^like^ the smell of sweat as such. Nor am I even talking about what the 'fume ~smells of~, directly anyway, atall - it's more that it is ^itself^ worked-up into a wholesome sweat through some lusty & hearty exertion. It's kind of like the aroma itself is alive & well-exerted to the point of being in a vigorous sweat. It's a thoroughly °sanguine° & enthusedly °panting° aroma. But this is what happens when an attempt is made to convey the olfactory impression made by musk-replete 'fumes. And I think the task of mapping ~collaterality~ of aromata belongs to the forum, really, as it is truly a Hercules-&-Hydra-n one; but imnensely fascinating. Anyway, this 'fume excels, to my mind, in that particular kind of musk note - the °sweaty° musk. Or is it kind of, a bit salty, or maritimey? There's no ambergris in this - none listed, that is to say. It's quite different fræ the °soapy° musk - that's probably the most common kind, but I love it also. I could spend all day discussing the nuances of different kinds of musk or quasi-musk. This °maritimey-salty-sweaty° kind is seldomlier-encountered, but I have come across it here & there, but generally in 'fumes more costly than this one. Some of Roja Dove's 'fumes have it. And when I tried it chez my worthy apothecaries, I thought "there it is again, but @ not-so stratosphærick a price!" . And it's one if my °swoon-factor-11° notes. And it's beautifully showcased in this by the lemon & lavender & orange-blossom; but it's probably a good job I didn't know there's lemon in - it would probably have putten me off. But everything's ~of-a-piece~ here; & also transfigured & exalted by the musk: and to my mind it is the exaltation that is important -- relatively to which that which is exalted is ancilliary ... within reason. Am giving this its first proper run-out: at the Whitworth Art Gallery. That °sweaty musk° that I keep going on about is just ... ! and gets better & better through the wearing. Some ambriness is becoming aparant. Seriously glad now the presence of lemon didn't get to put me off! Never thought uw could have donnen that with lemon. The sheer heft of this 'fume is phænominal. That sweaty musk is turning into rain! It really is: it's metamorphosing into rain! And this metamorphosis is catalysed by the lemon & lavender. But then, with retrospect, I realise that it ^always was^ kind of like rain - I'd just never brought that idea to the surface. And now I recall a review of Creed's ~Aventus~ I once read inwhich the aroma was befigured as ^pineapple + rain + smoke^. The blast of tart lemon at the top was really fabulous! But it left very quickly, leaving me unhappy due to the strong masculine sandalwood scent that arose. I don't see sandalwood in the notes, but it was very strong, and it made my head twinge. So, it is hard for me to rate this one. The opening was gorgeous and very tangy and fresh, but the rest was not my thing. It is unisex, but it leans masculine to my tastes. I had to wash it off, but even then I could still smell it. Too bad this one doesn't seem to share the longevity problems that plague this niche brand. Would that it had worn off a lot sooner! I sprayed Amyris over it, and it got better. Write the first Review for Petit Matin!